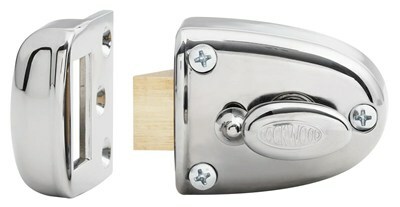 General purpose streamlatch designed to suit narrow stile doors. Opened by key from outside and by turnknob inside. Inside snib may be used to hold back or deadlock bolt so that key will not operate. Suitable for doors 28 to 45mm thick. 5 pin tumbler mechanism as standard. Supplied individually keyed with two keys per lock, alternatively, locks can be keyed alike.